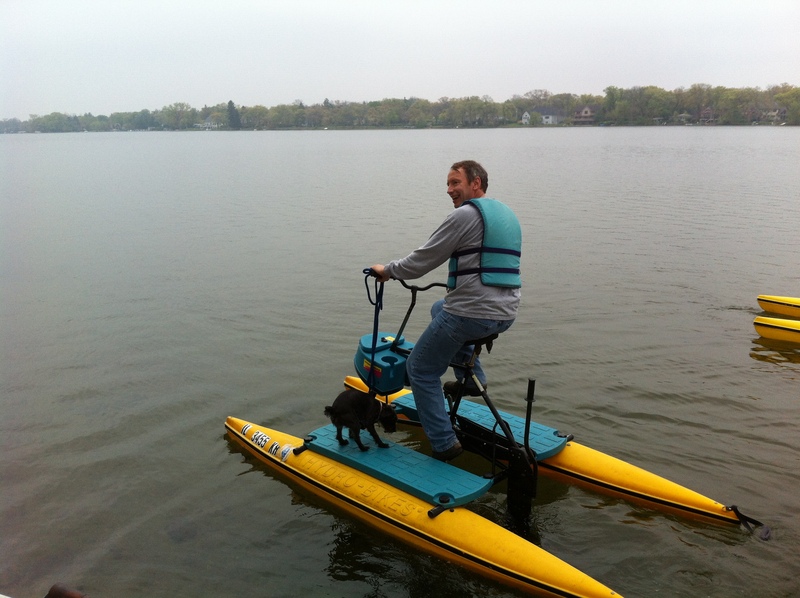 Hydrobike in Crystal Lake? 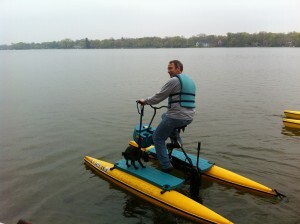 My friend Paul Myers offered to take me out for a hydrobike waterbike ride on Crystal Lake. Paul assured me the bikes were safe, steady and unlikely to tip. We left the pier on the water bikes with Paul’s dog as our mascot. Paul assured me I would not get wet though, as a precaution, I wore a life vest and I left my cell phone in the car. A hydrobike looks like a conventional bicycle attached a small platform straddling two pontoons. Riders peddle to turn the propeller and drive the impulsion system. There are no engines and the morning was nearly silent so we could easily talk as we water biked around smooth as glass Crystal Lake. Paul and his family live on Crystal Lake and enjoy regular family hydrobike outings. Paul’s puppy jumps right on the platform for these trips. Paul likes to take the hydrobike out for exercise early in the mornings. 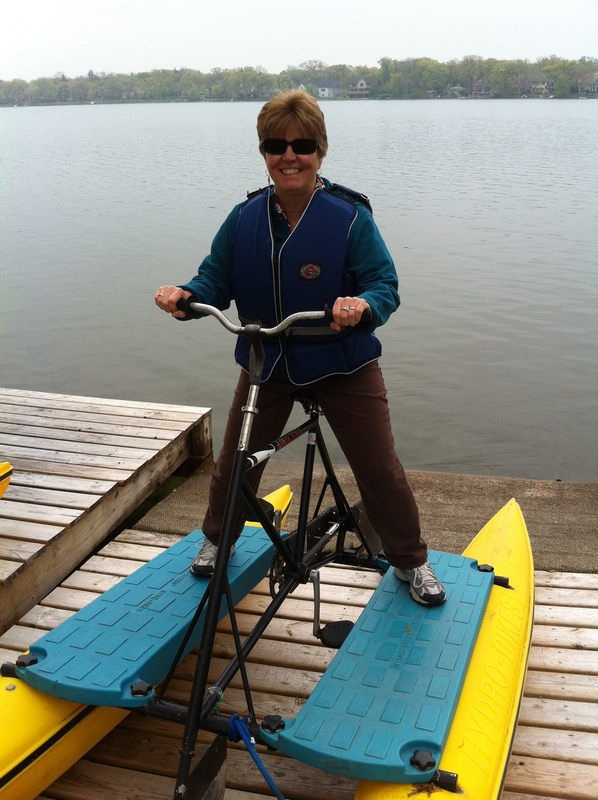 I quickly felt ease on the water bike and the only concern was when I wandered into a shallow, weedy area. A few seconds of back peddling was all it took to dislodge the thick water plants which had wrapped themselves around the propeller. Ray Buresch invented hydrobikes, the pedal powered waterbike, in 1989. He then founded Fun Watercraft. Paul told me he can easily waterbike about five miles an hour. The hydrobikes can easily be ridden in even the windiest and waviest conditions and they are almost impossible to tip over according to Fun Watercraft. You can even fish with a baitcasting reel from your hydrobike, something I didn’t have the chance to do the first time I saw this at Constitution Sportfishing San Diego. 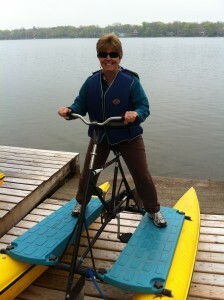 To learn more about these fun waterbikes, follow Hydrobikes on Facebook.